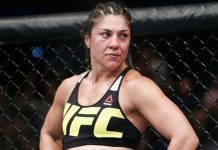 A women’s bantamweight bout between Bethe Correia and Marion Reneau took place on tonight’s UFC Fight Night 106 main card in Brazil. Round one begins and Reneau starts off quickly with a front kick. Bethe catches a second kick and delivers a couple of punches. Marion pulls her leg free and attacks with another kick. Bethe replies with a counter right hand. Both women seem more than happy to exchange on their feet. 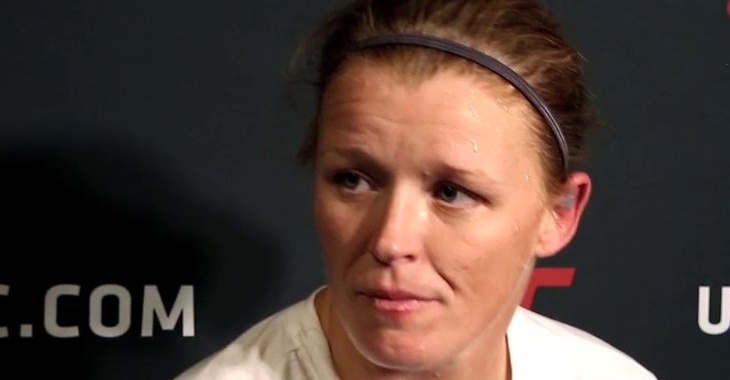 Marion with a left, Bethe replies with a right hand. Both women are connecting with good shots. Reneau lands a combination and then a hard leg kick. Bethe replies with a crisp right. She is only landing one shot at a time however while Reneau is landing some combos. Bethe scores a late takedown and winds up in half guard. Round one comes to an end. Round two begins and Bethe lands an early combination. 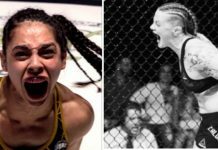 She digs in and presses Reneau against the cage. They break and Correia lands a right hand over the top. She circles out and then lands a nice left hand. Bethe with a good combination that backs up Marion. She lands a good uppercut and the crowd in Brazil reacts with cheers. They clinch up and on the break Correia lands a hard straight left. Bethe works a body-head combination. Marion fires back with a right hand of her own and then circles out. Reneau with another right hand inside. She is moving forward now. She lands a solid uppercut on Bethe. Correia retreats but then shoots in and lands another takedown. She begins working some short shots from the top. One minutes remains in the round. Marion is landing some good shots from the bottom here. 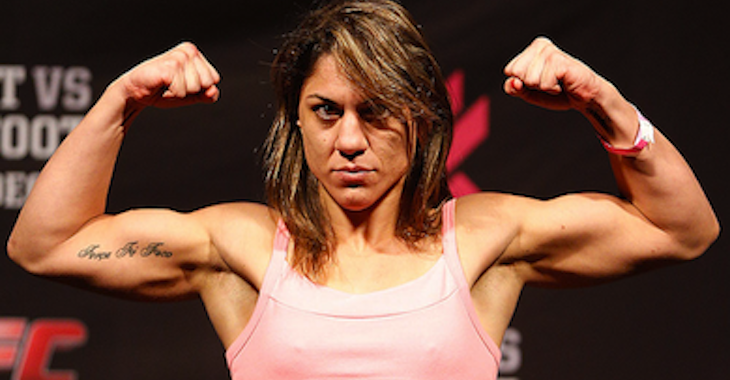 She locks up a triangle choke on Bethe but Correia fights her way out of the attempted submission hold. Bethe works some body shots but Marion is firing right back with hammer fists. Round two comes to an end. Round three begins and Reneau lands a body kick but Bethe counters with a hard right hand. Marion lands a high kick that rocks Bethe. She presses forward with a right. Bethe shoots in but cannot secure the takedown. The fighters are on the ground but Marion is in the better position. She is landing some hard shots in Correia here. Reneau eventually takes top position and begins working some hard shots. Reneau moves to mount and begins raining down punches on Correia who is bloodied u now. Bethe scrambles and is able to get back to her feet briefly but Marion sweeps her and gets her back on the canvas. Bethe is showing incredible heart here as she works her way back up. However, Marion quickly sweeps the Brazilian and takes her back. Reneau is working some solid shots from the back here. She locks in both hooks and begins searching for a rear-naked choke. She sinks in a body triangle. Both women are throwing shots here but it is Marion Reneau that is in dominant position. Round three comes to an end.